The fungus Volutella pachysandricola cause leaf blight and stem canker on Japanese pachysandra (Pachysandra terminalis). Japanese pachysandra are most susceptible to infection on older parts of the plant and those parts wounded by exposure to bright sun, winter drying, insect feeding, shearing, and transplant damage. 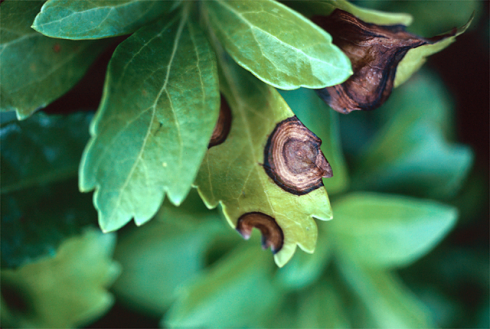 Initially, Volutella blight causes tan blotches with brown concentric rings on pachysandra leaves. In addition, stem infections disrupt water and mineral transport and sizeable parts of the plant beyond or above that point turn brown and die. When pachysandra plants are wet, fungus spores can infect wounded tissue. Insect feeding damage, winter drying, sunscald, pruning wounds, and stress from mineral and water deficiencies provide opportunities for the fungus to infect plants. Essentially, once the fungus infects wounded leaves it grows into stems of the plant. This is critical because Volutella canker infections often girdle stems causing large portions of the plant to die because the canker disrupts transport of water and minerals beyond that point. Volutella blight produces spores capable of infecting wounded leaves and stems throughout the growing season. Pink spore producing structures form on newly killed stems and leaves when conditions are moist in the spring and summer. While spores develop in another type of orange fruiting structure on the same tissue in the summer and fall. Successful intervention involves a combination of sanitation, modification of the growing environment, disease resistance, and fungicide treatments. Reduce inoculum by cutting out and disposing of infected leaves and stems when conditions are dry. If considering fungicide treatments, complete sanitation activities first. Think about whether the site is one in which Japanese pachysandra can thrive. Damage by Volutella blight is seldom serious to plants with good vitality. Volutella is an opportunistic pathogen. Grow Japanese pachysandra in a shaded site, minimize wounding, and maintain vitality of the plants. Water plants before midday so the leaves dry quickly in the afternoon, and do not plant holly or pachysandra in sites where conditions remain moist for extended periods. Protect plants from exposure to drying winds or winter sun using mulch that does not hold moisture such as straw. 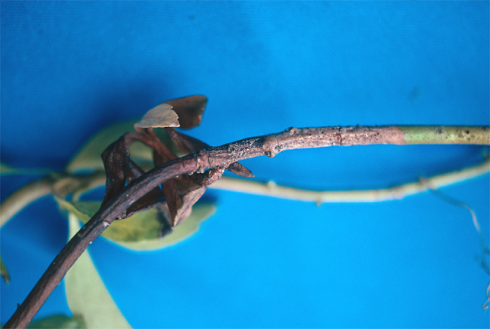 Many outbreaks of Volutella are associated with winter desiccation damage. If the Volutella blight of Japanese pachysandra persists, consider growing Allegheny pachysandra (Pachysandra procumbens), which is less susceptible to the disease. Fungicides are useful during wet periods, especially on wounded plants. Protectant fungicides act to prevent infection before it occurs. Systemic fungicides can have curative action because the leaves absorb them to a limited degree, but they cannot eliminate lesions or dead tissue. Apply fungicide sprays when new growth starts, wounding events happen, or at first symptoms of Volutella blight. Reapply if moist conditions persist at labeled intervals. In addition, damage by insects that feed on foliage may provide sites for Volutella infection. Consider control measures to reduce insect damage if their wounds contribute appreciably to Volutella blight in the planting. Photos: E. M. Dutky, Diseases of Woody Ornamentals and Trees. APS Press.